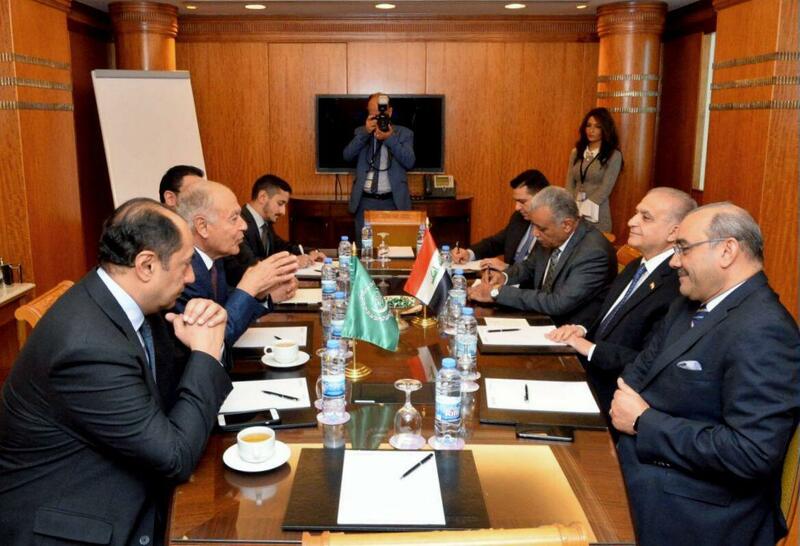 Foreign Minister Mohammad Ali al - Hakim, on Thursday, with the Secretary General of the Arab League , Ahmed Aboul Gheit , the future role of Iraq in the Arab League. "Foreign Minister Mohamed Ali al-Hakim met with Arab League Secretary-General Ahmed Aboul Gheit in the Lebanese capital Beirut on the sidelines of the joint meeting of foreign ministers and ministers concerned with the Economic and Social Council preparatory to the Arab Development Summit: Fourth. " "The meeting discussed a number of issues of common concern, especially with regard to the future role that Iraq will play in the Arab League, especially through its presence in the organization and the nomination of a number of Iraqi personalities to positions within the university." "He also touched upon a number of regional and Arab issues, including Syria and Yemen, and the role of the Arab Group and the mechanisms coordinating their efforts at the United Nations." Foreign Minister Mohammed Ali al - Hakim, on Thursday, with the Secretary - General of the League of Arab States Ahmed Abul Gheit in the Lebanese capital , Beirut , the future role to be played by Iraq in the Arab League and the nomination of a number of Iraqi personalities to positions within the university. A statement from the foreign ministry said Hakim met Arab League Secretary General Ahmed Aboul Gheit in the Lebanese capital Beirut on the sidelines of the joint meeting of foreign ministers and ministers concerned with the Economic and Social Council preparatory to the Arab Economic and Social Summit. The statement added that the two sides discussed a number of issues of mutual interest, especially in relation to the future role that Iraq will play in the League of Arab States, especially through its presence in the organization and the nomination of a number of Iraqi personalities to positions within the university. The statement pointed out that Hakim "touched on a number of regional and Arab issues, including: Syria and Yemen, and the role of the Arab Group and the mechanisms to coordinate their efforts at the United Nations." Foreign Minister Mohamed Ali al-Hakim arrived in Beirut, Lebanon, to participate in the joint meeting of foreign ministers and ministers concerned with the Economic and Social Council preparatory to the Arab Economic and Social Summit. It is hoped that the participants will discuss social and economic development issues; to raise the economic reality, address the problems that hinder the development of Arab economies, and keep up with the latest developments in the world. Hakim was received by the Minister of State for Anti-Corruption Affairs Nicola Tueni representing Lebanese President Michel Aoun.